Our swot analysis template is the perfect first step in launching a business venture or acquiring a new business. This simple swot analysis spreadsheet makes it simple to gauge the strengths and weaknesses of your company or venture over the competitors. This swot analysis template involves determining the core skills of your company compared with the core skills of one or more competitors. In the first section of the swot analysis template, you’ll be prompted to evaluate the aspects of your company or proposed company that give you an advantage. By using a swot analysis, you can get a bigger picture of the issues that can face your company or venture as well as the areas where there is more opportunity for success. This is a great way to get a more well-rounded picture of the business landscape in your chosen venture. Careful planning is the key for success in any area and this swot analysis template is the right place to get a start. You’ll also have the opportunity to explore any threats that may impact your venture by using this swot analysis template, which is imperative when it comes to determining otherwise unforeseen threats to your business or monetary venture. 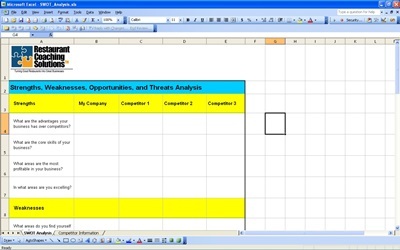 Our swot analysis template, like many of our spreadsheets and calculators, is one of our more popular options and we offer this template for free to all of our visitors. If you find this swot analysis template useful, don’t hesitate to share this page with your friends and coworkers and spread the word about our free templates, spreadsheets and calculators.